Overgrown mangrove jungle at the Liquor Still site in the Ten Thousand Islands. Totch Brown’s Liquor Still in the Ten Thousand Islands, Everglades. Take a look at the panoramic above and imagine hacking out a small clearing in the above mangrove forest to live in and operate a clandestine moonshine still. This is what Totch Brown’s father John Brown did during the Great Depression to make ends meet during those difficult times. His life story is fascinating, and I couldn’t possibly do it justice here, suffice to say I will mention that you should read Totch: A Life in the Everglades by Loren G. Brown. In this post I will offer you a photo-journey-essay of a quest to find this “lost” bit of old Everglades history. In October of 2011, I was afforded the opportunity to paddle and find this site in the aptly named “Liquor Still Bay”, so I jumped at the chance to explore a colorful bit of the old time Everglades! The plan was to paddle to the find the still, check it out, and continue on to our campsite. Next day return via a different route, for a rough total of about 42 miles or as it would turn out to be. 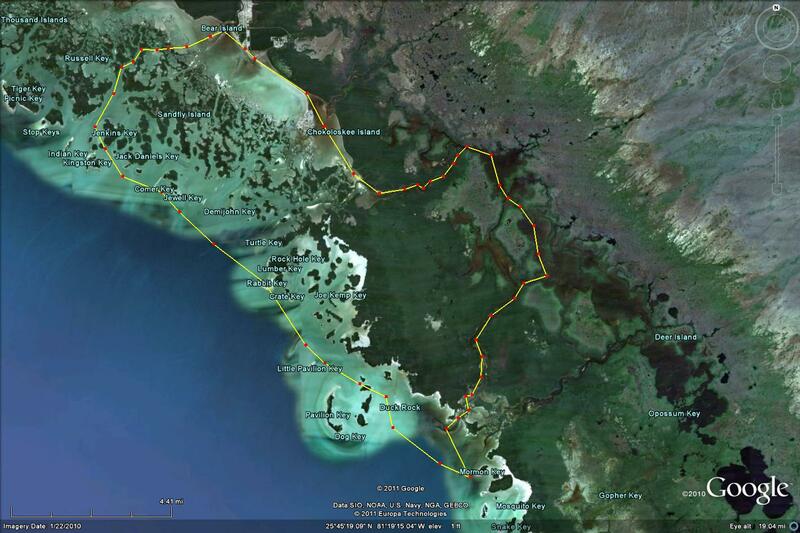 Approximate route taken over 2 days totaled up about 42 miles of paddling! The Banana Boat flying the colors at the launch in Everglades City. First stop at the Lopez River Campsite. Ted taking a “break” at the Lopez River Campsite. To help preserve the integrity of this site, I am purposely vague with our route and omitting any directions – sorry! Arrival in Liquor Still Bay deep in the Ten Thousand Islands! The overgrown entrance could be anywhere and was hard to spot! Entrance to the liquor still site hidden in the mangroves. Remnant old wood planks leading to the still site. Finally, the remains of the still site literally pop out of the woodwork! First look at the Liquor Still Bay site. Compare these pics with this video filmed in 1993, The Everglades Outlaw, Totch Brown, watch @ 3:26 as the camp was re-created for a documentary! A Banana Spider guards the path at Liquor Still Bay. Pieces of an old wood barrel. Remains of the concrete storage pen as described in Totch’s book. The Liquor Still (replica prop) in October of 2011. Original still foundation circa 1930 at Liquor Still Bay. Liquor Still in timeless black & white. As a young boy, Totch lived in an 8 x 14ft tar shack just behind the still! John Brown had filled the camp with shells and debris to create a shell mound much like the Calusa Native Americans had done many generations previously throughout the Ten Thousand Islands. Raised path made of shell material and other fill in 1930. Canopy provided some nice shade at the entrance to the Liquor Still site! CLICK to enter a time portal into the old Everglades! ART at Liquor Still Bay – hidden history in the Everglades. With the Liquor Still Bay mission accomplished, we headed out into the Gulf on a slack tide. The paddling was easy and serene here, and not at all what the Gulf waters had in store for us! Heading out to the Gulf of Mexico on the Huston River. Once out in the Gulf, winds had picked up as our first “big” fall cold front had moved in over the area, kicking up 3 -5 ft seas. As it was getting late, and we had already paddled 20 miles, we elected to surf down-weather towards Mormon Key only a couple of miles south. About 20 minutes later we were beaching the boats and enjoying the refreshing 15-20 knot NW winds and sunset! Late afternoon / early evening arrival on the beach at Mormon Key. One of those crazy Gulf sunsets .. that’s what you come out here to see, right!? Moon setting over Mormon Key beach in the Ten Thousand Islands. The next morning was very comfortable and clear, winds had shifted to the N-NE and dropped considerably. One cool thing about Mormon Key is that it is completely covered in shells, from pulverized microscopic pieces (i.e. “sand”) to foot-long pieces and giant clams. The ancient Calusa ate well, I think! Mormon Key beach is made of all shells, of all sizes! On a different note, as beautiful as it is, this beach has been overtaken by sandspurs (“sticklers”), like the one’s you’ve painfully stepped on at the beach. Sadly I don’t think you can find a spot that isn’t covered with them here! They will poke through your tent floor, and into your mattress and/or private parts, and you will need three layers of tarps to prevent this. Even after you think you’ve got rid of them all, you will find even MORE! My final surprise was a few that managed to attach themselves to the underside of my sprayskirt as I went in to launch my kayak! Sea Grape buds about to open on the beach at Mormon Key. Into one of these flowers! Prickly Pear Cactus growing on Mormon Key shell beach. Launching back out over all the shells on Mormon Key beach. Last stop on the Rabbit Key sandbar in the 10k basin. CLICK to enter if you dare! ART at Liquor Still Bay – hidden history in the Everglades! and Esther of the Miami Kayak Club for the great company! © 2012-2016 Flex Maslan / kayakfari.com / awakenthegrass.com. All original photographs, artworks and music in this portfolio are copyrighted and owned by the artist, Flex Maslan, unless otherwise noted. Any reproduction, modification, publication, transmission, transfer, or exploitation of any of the content, for personal or commercial use, whether in whole or in part, without written permission from the artist is strictly prohibited. Rough waters, long distances, congratulations on another challenging voyage.